Because it didn’t take a lot of loss in Life in the Boomer Lane’s life to make her understand how precious every days is. And because each birthday is her best gift to herself. Because LBL is wise enough to know that her children aren’t perfect and wiser still to believe that they really are. Because LBL is funny. And, thankfully, funny can be used for a lot more than laughter. Because as soon as LBL stopped being a victim, she knew what power felt like. Because LBL can still read the small lines on menus and she can still read between the lines of what people say and do. Because LBL has learned that the only thing she can ever change in her world is her. And most of the time, that’s all that is needed to change everything else. ← Please don't take my crappy cell phone away from me! Words to live by, Renée…I’m grateful for you too! Thanks, Wendy, and ditto. Blogging has been a gift in so many ways, chief of which has been to be able to peek into the lives/minds of others and to communicate in a way that makes something like Facebook seem so inane. And a wonderful Thanksgiving to you! What a lovely post! I”m grateful to have discovered you from a link on Lisa’s “Notes from Africa” and to be celebrating my first Thanksgiving in Haiti. I blog about my less-than-ordinary, sometimes down right bizarre experiences in Port-au-Prince, where my partner does disaster response and I’m a stay-at-home-artist/writer, trying to settle in a decidedly unsettled part of the planet. Thanks for these reminders! Thanks for reading, Kathryn. Now I must check out your blog. The situation in Haiti is deplorable for so many reasons. The more I read, the less it makes sense and the more outraged I get. Now to read your blog! Wonderful post, Renee. Have a lovely Thanksgiving … will you be in London for that? And you as well! Yes, I’ll be taking a red eye on Wed PM and arriving early Thurs AM. This will be a short visit (one week) and there will be lots going on. But I’d love to meet you in person on my next trip. Can you give me your number? Wow… This is truly beautiful. Goes back to that age-old adage, I think, of you can’t love anyone else until you love yourself. Being thankful for who you are, for your own strengths and gifts and existence in this world—it is so important and yet so easy to forget. Thank you for the reminder. You are welcome. We all forget that sometimes, don’t we? I remember when, years ago, my world was falling apart and I decided to write down everything that was good about me that was non-negotiable. I wrote, “I am funny.” At that moment, it was the only thing I was absolutely clear about. And in that moment, it was enough. Slowly, I was able to expand the list, thank goodness. All the above have charming things to say, but if the sun is 87 bazillion degrees F, how do you hold it in your hands like that? Does the sun go out when you wash your hands? What happens when you clap your hands? From a philosophical point of view, is that a sunrise or a sun set? “The only thing in the world I can change is me.” Now I have been taught that too, but I cannot identify the tipping point between wise acceptance and apathy, immobilization, being pro active and not accepting what is unacceptable. I am sure glad Dr. King and Thomas Jefferson or Dr. Jonas Salk did not feel this way. Apathy and blind acceptance are never acceptable. The changing isn’t about an abdication of one’s values. It’s about a change in perception or a change in approach. I find I’m far more powerful when my goal is to enroll others in my vision, rather than to draw a line in the sand. 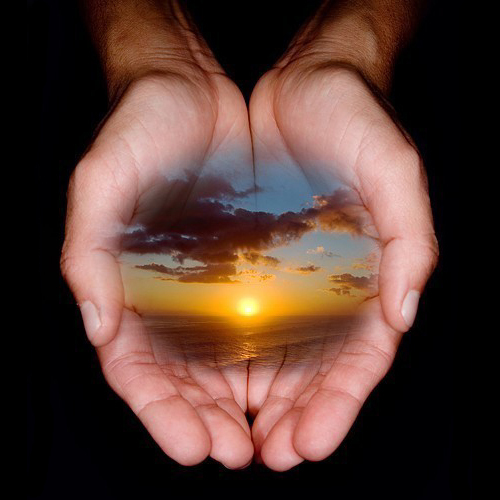 Re the sun in one’s hands: Carl, I’m reminded of Ferlinghetti’s book title, “A Coney Island of the Mind.” It fits you. I always look forward to your unique spin. Quite a compliment. Thank you. Was not familiar with him and read a little tonight. It’s different and would need study with commentary. My education poetry -John Bunyan, John Donne, Chaucer, Shakespeare, Tennyson, Longfellow. Only modern I can internalize is Dylan Thomas. Stuff in New Yorker seems drivel. Yeah, it’s Coney Island in my head alright and most often it’s not me but someone else selling the tickets and running the show with me as mere spectator. Carl, without any fancy talk, I have to tell you that I always really like what you have to say. I wish we could grab a coffee and just go quietly nuts. Quite empowering. I hope people take a bit of the wisdom with them during the holidays, which always seem overly difficult to enjoy. It is never easy for everyone to be positive in the cold weather and high expectations. Right so. Some of my best and worst moments have occurred during the holiday seasons. Sometimes during the same holiday. Sometimes during the same moment. What a wonderful post and wise words to live by. Happy Thanksgiving to you and yours. Enjoy! Thanks, Joanna, and the same to you! What a nice reminder to be thankful for the right things. Have a good Turkey Day, Renee. Thanks, V.V., and the same to you.